Budoff Brown can now check that goal off because the new, radically different Politico.com goes live today. Site readability has improved, and there’s a new, unadorned typeface named Din, which replaces the old Proxima Nova type. Additionally, the background is lighter, and there are no longer condensed fonts on the site. One question that needed to be asked: Why redesign a website that has seen its traffic increase more than 30 percent year over year to date, and averages more than 26 million uniques per month? Budoff Brown says it really comes down to flexibility and the changing ways in which Politico’s journalists are producing content. Previously, the site wasn’t particularly conducive to the increasing amount of visual journalism its journalists were producing. 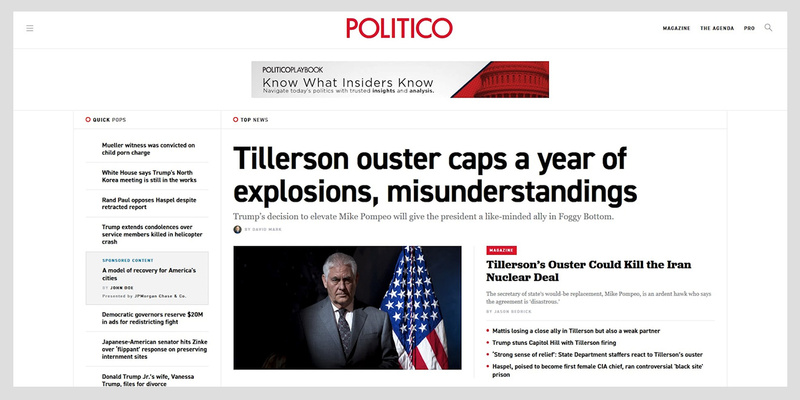 The new Politico.com has the ability to evolve as news happens—whether that’s breaking news, big event news, live coverage or Politico exclusive interviews with newsmakers. With how the current political news cycle functions in the era of Trump, adaptation is essential. Sampsel, who led the redesign, is a veteran in this space. She was head of digital design and strategy at The Washington Post before assuming her present role at Work & Co., and has worked on a number of website redesigns, including a number of public projects, Disney’s Freeform (formerly ABC Family), the award-winning Marriott app, and the recent website redesign of TechCrunch. While many readers continue to visit the website via computer, Politico’s mobile traffic is significant. That’s why Politico ensured its redesign would be very mobile-friendly. With the new mobile design, there’s one tab with an up-to-the-minute feed of breaking stories and new developments. The other tab has other Politico stories. With a greater focus on how the content reads on mobile, will Politico editorial be impacted in any way? For instance, will stories become more concise? Budoff Brown says Politico is always considering new ways of doing things differently from an editorial standpoint, and will continue to respond to readers habits. “I think this is one way that we’re doing that, and we’re going to be looking at other ways to do that as well,” said Budoff Brown, though she didn’t elaborate on what those other ways would be. Politico is also known for its daily email newsletters. The Politico Playbook is widely read by politicians and those involved in politics, while the Morning Media newsletter focuses on the latest about the news and political media. Politico also sends out newsletters Morning Money and Morning Cybersecurity.